GAP Welfare Services, a division within the GAP Group that specialises in the hire of environmentally sustainable welfare units, are celebrating the delivery of their 1000th mobile welfare unit supplied by the leading manufacturer, AJC Trailers. AJC have been supplying GAP with mobile welfare units since May 2014. They currently have a range of units available for hire, from the diminutive 12’ through to popular 16’ and a spacious 20’ set-up. 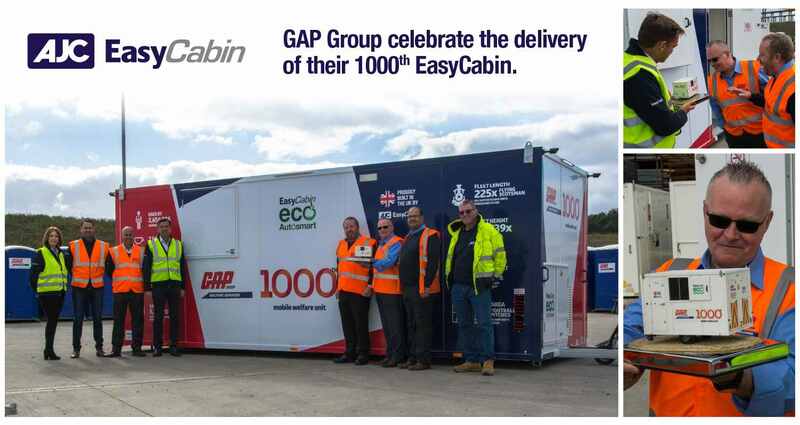 The presentation at GAP’s Derby depot included an exact scale model of an EasyCabin 12’ mobile welfare unit dressed in GAP livery. “12 feet down to 12 inches,” quipped, Jav. The mini mobile welfare unit was handed to GAP’s Operations Director Kevin McEwan and Welfare Services Divisional Operations Manager Keith Bodinnar. In keeping with the company’s Green Action Plan, GAP’s range of welfare units manufactured by AJC, offer numerous environmentally friendly features to reduce emissions, maintenance, fuel consumption, generator hours and noise pollution. GAP Welfare Services is one of eight GAP divisions, all of which specialise in equipment hire across the UK. AJC EasyCabin has recently been awarded a Green Apple Environment Award in an international campaign to find the greenest companies, councils and communities. AJC competed against more than 500 other nominations in the Green Apple Awards for Environmental Best Practice and will be presented with a trophy and certificate at an award presentation ceremony in the Houses of Parliament, London, on 6th November 2017.